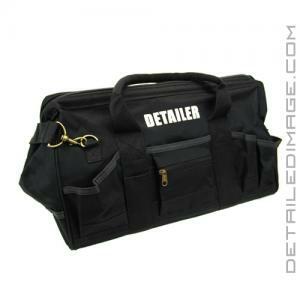 Carry your polisher and other detailing items, safely and easily with the Detailer Buffer Tool Bag! 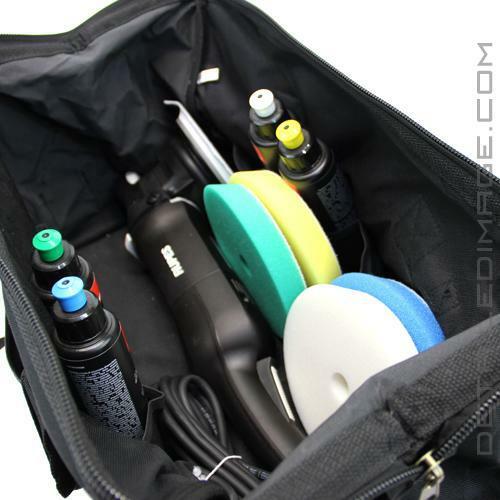 Lugging around your polisher, polishes, microfiber towels, brushes and other detailing items can be, well, pretty tough at times. Multiple boxes or bags can be necessary for very large details, but they can take up a lot of room, be tough to maneuver, heavy, unorganized and even a bit unprofessional. This bag solves these issues and helps you keep your buffer safe! The roomy main compartment has a wide zippered opening that is reinforced with wire. This allows the bag to open up wide enough to add various different polishers and other items with ease. The large buffers like Rupes Mark II, Griot's Garage BOSS Polishers, Flex XC 3401 and many others fit in with ease and there is additional room for some of your other favorite products. Numerous pockets and slots for different kinds/sizes of tools, brushes, polishes, shampoos, etc. are featured on the front, back, both sides, as well as inside of the bag. This helps you take exactly what you need with you while keeping everything organized. When the buffer is not in use you can keep it in the bag so it is protected from dust, moisture, etc. so it runs great for years to come. 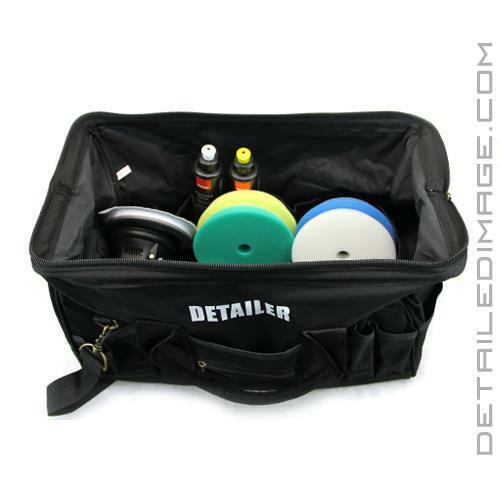 Best yet, this bag is made of durable 600D polyester with PVC backing, features reinforced webbed handles and a sturdy bottom that allow this bag to stand up to the rigors of every day detailing. There's also the screen printed "Detailer" logo as well! This same bag is also available in blue with the Detailed Image logo. Pick up the Detailer Buffer Tool Bag today to store and carry your detailing supplies!